Nobel Peace Prize for Bangladesh, a moment of joy | Synchronicity! Synchronicity! Just yesterday morning i was talking with a friend who was sharing her spiritual awakening when she was listening to a tape of Dr. Jane Goodall. I heard of Dr. Jane, but didn't know the extent of her noble contribution in the conservation of nature, animal right and scholarly work. So i decided to know about this person and i was listening to her talk on google video about which i posted last day. During the enlightening talk she told how Dr. Yunus of Grameen Bank is like a role model to her. Dr. Yunus is the pioneer of micro-credit, the model which is used even in the poorest village of Africa or Latin America to enpower poorest of the poor people. Specially the benefit is targeted to the poor women. 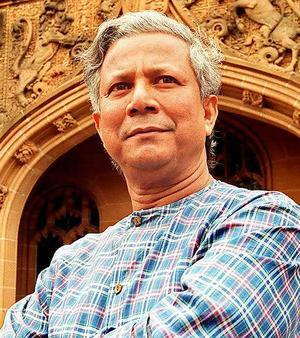 I was proud to hear about Dr. Yunus because he is from my country, Bangladesh and the model of micro-credit is a very 'Bangladesh made' successful model adopted to the world. Interestingly as i finished listening the video with much sense of joy that Dr. Yunus was appreciated by a personality like Dr. Jane Goodall. And surprisingly that noon i heard the news that Nobel foundation awarded the 2006 Nobel Peace Prize to Dr. Yunus. Synchronicity, Meaningful coincidence, huh?! It was a great joy and moment of happiness. First because this is for the first time a Bangladeshi (my native country!) got Nobel prize. And secondly because it is awarded to someone who is not partisan, not political but someone who genuinely work for the people to alleviate poverty in the world. Dr. Yunus set up the bank in 1976 with just $27 from his own pocket. Thirty years on, the bank has 6.6 million borrowers, of which 97% are women. Dr. Yunus is an inspiring face for millions of poor people across the globe. He is revered by millions of poor to give them the opportunit to change their lives. In our time, more people die of hunger than war. So its not really surprising when the Nobel committee decided to give him for Peace. Poverty is one of the worst hinderance of peace in our world. Without food, even the thought of peace doesn't exist. I am proud to be a Bangladeshi!
. Key Facts about MicroFinance | Q&A: What is Microfinance? Technology of the Heart: Nobel Peace Prize for Bangladesh, a moment of joy | Synchronicity!